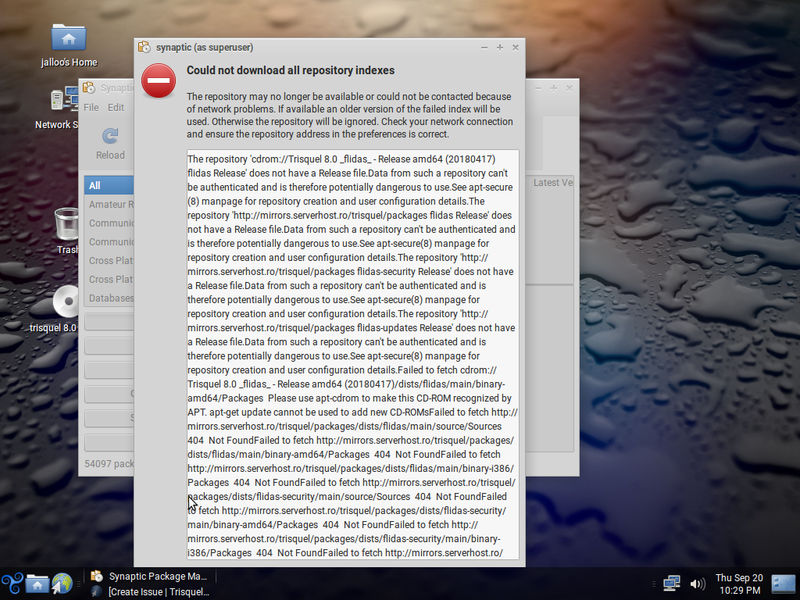 Could not download repository indexes | Trisquel GNU/Linux - Run free! I have attached a picture of the message that shows up. I have also tried changing my Ethernet cable to see if that fixes the problem, but that is not the case.Thank you for your help in advance. You appear to have an incorrect /etc/apt/sources.list that is full of broken links. Can you replace its contents with the following and see if that works? thank you MOAZ786, I tried the technique you showed and it now works with the help of chaosmonk.I want to thank you once again for the help. and replace the contents with those that moaz786 provided. If you would prefer a graphical solution, please tell me which step failed when you tried my solution and I'll help you troubleshoot. i have no knowledge of programming and thank you for the help.With your approach the result was to check my connection & could not download repository indexes again. I will prefer the graphical steps thank you. "pluma : command not found "
Try replacing `pluma' with `gedit'.